Whalers and sealers had been visiting and working the coastal areas around Port Fairy and Portland areas throughout the 1830s. John Griffiths from Launceston set up a bay whaling station on Griffiths Island at the entrance to the Moyne River, and this encouraged some informal settlement at Port Fairy. This situation changed dramatically in 1843 when James Atkinson formally acquired under Special Survey provisions title to 5,120 acres west of the Moyne River. In 1841, Atkinson, having completed the clearing of the town area, began survey work for town streets, blocks and allotments. The few existing settlers at Atkinson's new town of Belfast, as it was originally called, had no rights to title to their land, but Atkinson quickly established leasing arrangements in order to provide some commercial return to Atkinson and his partners and to encourage further settlement. In September 1845, William Middleton executed a lease with Atkinson for the land at the corner of Campbell and Gipps Streets and apparently commenced construction of the inn. It was known at that time as the Royal Merrijig Inn in order to differentiate it from the earlier Merrijig Inn which had been constructed by Archibald McNeill near the Moyne River prior to the set out of the town allotments. The Royal Merrijig Inn was certainly in operation by 1847 and in 1848 James Burns, late of the Steam Packet Hotel, Launceston, advertised that considerable alterations had been made at the hotel to make gentlemen and families more comfortable and also, a billiard table had been procured at considerable expense. The strategic siting of the Royal Merrijig Inn opposite the jetty ensured its popularity and the hotel became the headquarters of the coastal whalers in the 1840s and later of William Rutledge, a local patron and powerful merchant. In 1850, the hotel was reportedly almost destroyed by fire but the business apparently struggled on into 1852 when the remaining furniture was sold off and the hotel closed. In 1853, the government acquired the lease of the property for public purposes. A large two storey addition on the Campbell Street frontage was used as police barracks and government offices. Courts sat at the Royal Merrijig Inn until 1860 and the building also housed the officers of the Belfast District Road Board (from 1853) and the municipality of Belfast (from 1856-58). The government gradually acquired other sites for their purposes and disposed of the property in 1885 to Captain Frederick Trouten. A photo of the building taken during Trouten's ownership indicates that the former hotel was used as a boarding house. Trouten's widow sold the property in 1901 in three parts; Merrijig House, allotments in Campbell Street created through the demolition of the two storey building formerly used as government offices, and various allotments facing Gipps Street. In the 1980s, the Merrijig Inn was renovated and reopened as a small private hotel. The Merrijig Inn is a single-storied masonry structure with attic level located on a corner site facing the Moyne River. The building has an angled corner with doorway, unusual multi-pane sash windows with pivoting central panes, and a high, hipped roof with original shingles now hidden under later corrugated iron sheeting. Internally, original hardwood flooring survives. The building retains the simplicity of its original colonial form despite many external and internal alterations including the addition in 1987 of dormer windows to its attic storey which replaced original simple skylight openings. A conservatory was also added at this time. The inn and rear wing were physically linked to a late nineteenth century cottage on Campbell Street by a mid-1990s infill structure. 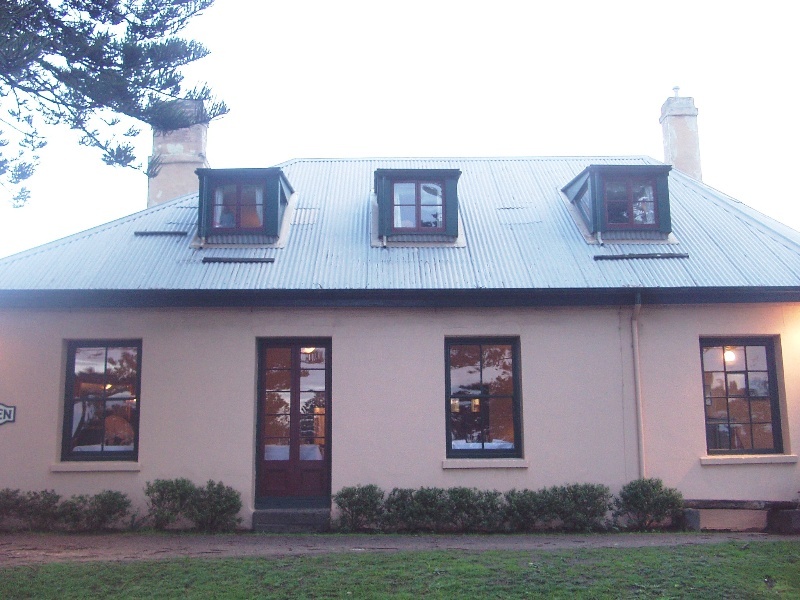 The Merrijig Inn is of historical and architectural significance to the State of Victoria. 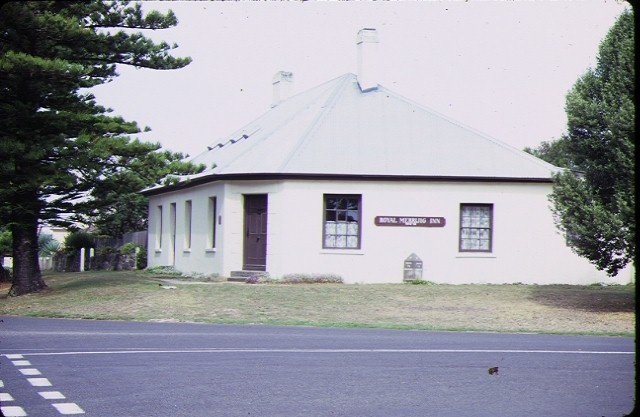 The Merrijig Inn is of historical significance as one of the oldest surviving hotels in Victoria. Its location facing the site of the original jetty is central to the understanding of the development of Port Fairy in the 1840s following its officially sanctioned settlement. 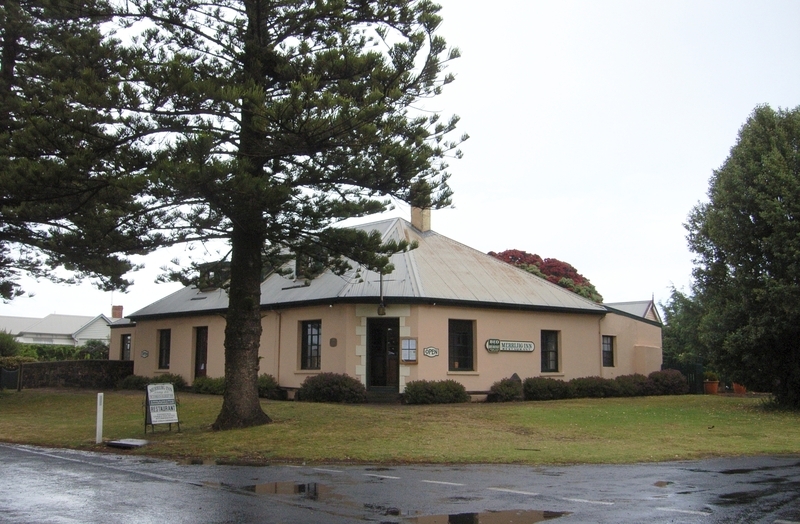 The remaining portion of the hotel is important for its association with governmental and municipal affairs in Port Fairy for more than thirty years. The Merrijig Inn is of architectural significance for its distinctive architectural form characteristic of early colonial building. Although the building has been substantially altered in detail, it retains the simplicity of its original form and much of the original and early fabric survives behind cosmetic changes. 1. All of the building marked B1 on Diagram 248 held by the Executive Director. 2. All of the land marked L1 in Diagram 248 being all the land described in Certificate of Title Volume 10301 Folio 205 and held by the Executive Director. Whalers and sealers working out of Launceston had been visiting the coastal areas around Port Fairy and Portland areas throughout the 1830s and some had set up camps and huts during their stays. The informal settlement situation at Port Fairy Bay changed dramatically in 1843 when James Atkinson formally acquired title to 5,120 acres west of the Moyne River, most of which Atkinson had taken up under licence in 1839. In 1841, Atkinson, having completed the clearing of the town area, began survey work for town streets, blocks and allotments. The few existing settlers at Atkinson’s new town of Belfast had no rights to title to their land, but Atkinson quickly established leasing arrangements in order to provide some commercial return to Atkinson and his partners and to encourage further settlement. 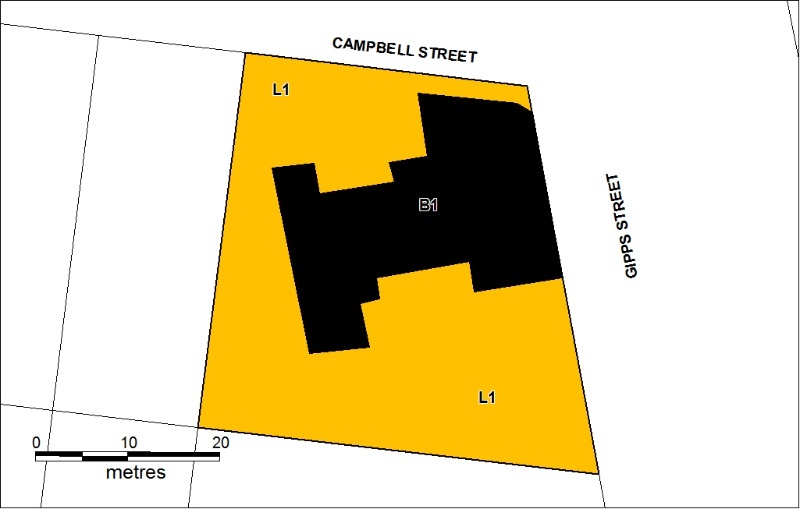 In September 1845, William Middleton executed a lease with Atkinson for the land at the corner of Campbell and Gipps Streets and apparently commenced construction of his new Royal Merrijig Inn shortly after. The Royal Merrijig Inn was probably built in 1845-46 and was certainly in operation by 1847. In 1848, James Burns, late of the Steam Packet Hotel, Launceston, advertised that considerable alterations had been made at the hotel to make gentlemen and families more comfortable and also, a billiard table had been procured at considerable expense. The new hotel was named the Royal Merrijig Inn to differentiate it from Middleton’s Merrijig Inn which had been constructed by Archibald McNeill near the waters edge prior to the set out of the town allotments. The strategic siting of the Royal Merrijig Inn opposite the jetty ensured its popularity and the hotel became the headquarters of the coastal whalers in the 1840s and later of William Rutledge, a local patron and powerful merchant. In 1850, the hotel was reportedly almost destroyed by fire. The business apparently struggled on but in 1852 the remaining furniture was sold off and the hotel closed. In 1853, the government acquired the lease of the property for public purposes. A large two storey addition on the Campbell Street frontage was used as police barracks and government offices. Courts sat at the Royal Merrijig Inn until 1860 and the building also housed the officers of the Belfast District Road Board (from 1853) and the municipality of Belfast (from 1856-58). The government gradually acquired other sites for their purposes and disposed of the property in 1885 to Captain Frederick Trouten. A photo of the building taken during Trouten’s ownership indicates that the former hotel was used as a boarding house with a sign ‘Board & Residence’ visible on the Gipps Street facade. Trouten’s widow sold the property in September 1901in three parts; Merrijig House, allotments in Campbell Street created through the demolition of the two storey building formerly used as government offices and various allotments facing Gipps Street. In the 1990s, the Merrijig Inn was re-connected to its original kitchen wing and the building was renovated and reopened as a hotel. The surviving portion of the Merrijig Inn is a single-storied, cement rendered, stone structure located on a corner site facing the river Moyne. The building has an angled corner with doorway and the high, hip roof is one of the features of the building. The building retains the simplicity of its original colonial form despite many external and internal alterations and the addition in 1987 of dormer windows to its attic storey. The angled corner door, the Georgian window sashes are characteristic of early colonial architecture in Victoria. The attic was originally lit by unusual pivoting windows but the 1880s photo indicates that these had by then covered over by the corrugated iron sheeting to the roof which had been fixed over the original shingles. The pivoting windows have been removed and replaced by the dormers. Port Phillip Herald, 14 Dec 1848, p 3. Personal communication, Marten A Syme, 19 April 2005.
. Removal of extraneous items such as air conditioners, pipework, ducting, wiring, antennae, aerials etc, and making good.
. The door from the bar area to the ground floor bedroom can be fixed shut and the opening on the bedroom side filled with sound insulation and finished with a slight recess to the wall with plasterboard. Architraves should be left intact.
. Installation, removal or replacement of kitchen benches, cupboards and fixtures including sinks, stoves, ovens, refrigerators, dishwashers etc and associated plumbing and wiring to existing kitchen space.
. Installation, removal or replacement of curtain track, rods, blinds and other window dressings.
. Installation, removal or replacement of hooks, nails and other devices for the hanging of mirrors, paintings and other wall mounted artworks.
. Installation, removal or replacement of carpets and flexible floor coverings.
. Refurbishment of existing bathrooms, toilets and or en suites including removal, installation or replacement of sanitary fixtures and associated piping, mirrors, provided that the existing structure of the building core remains in place.
. Installation, removal and replacement of electrical wiring provided that all new wiring is fully concealed.
. Installation, removal and replacement of bulk insulation in the roof space.
. Public Safety and Security : The following public safety and security activities are permit exempt under section 66 of the Heritage Act 1995, a) public safety and security activities provided the works do not involve the removal or destruction of any significant above-ground structures or sub-surface archaeological artefacts or deposits; b) the erection of temporary security fencing, scaffolding, hoardings or surveillance systems to prevent unauthorised access or secure public safety which will not adversely affect significant fabric of the place including archaeological features; c) development including emergency stabilisation necessary to secure safety where a site feature has been irreparably damaged or destabilised and represents a safety risk to its users or the public. Note: Urgent or emergency site works are to be undertaken by an appropriately qualified specialist such as a structural engineer, or other heritage professional. The purpose of the permit exemptions is to allow works that do not impact on the significance of the place to occur without the need for a permit. Alterations that impact on the significance of the exterior and interior are subject to permit applications. The exemptions policy recognises that some alterations have occurred, mainly to the interior of the building, and that further renewal will be required from time to time. The property comprises an 1840s masonry structure with attic storey addressing the corner of Gipps Street and Campbell Street; a rear wing of masonry walls and apparently modern roof; and a nineteenth century cottage facing Griffiths Street linked by a 1996 infill structure to the original inn. The primary significance of the Merrijig Inn lies in the age of the fabric and overall form of the 1840s structure and rear masonry wing, although the cottage contributes to the significance of the place. This 1840s and 1850s fabric is considered as being of primary significance. Internal walls, floors and joinery in the earliest parts of the building are preferably left intact, and must not be disturbed or painted without a permit. The attic storey bedrooms have been created by partitioning with plasterboard walls, and reconfiguration of the attic storey to fewer larger rooms should be possible without intervening in original fabric. The reception area addressing Campbell Street is infill added in 1996 and no permits are required for internal works to that space.